As you may know, Pale Moon is an open-source, cross-platform browser based on Mozilla Firefox, being up to 25% faster then the original. 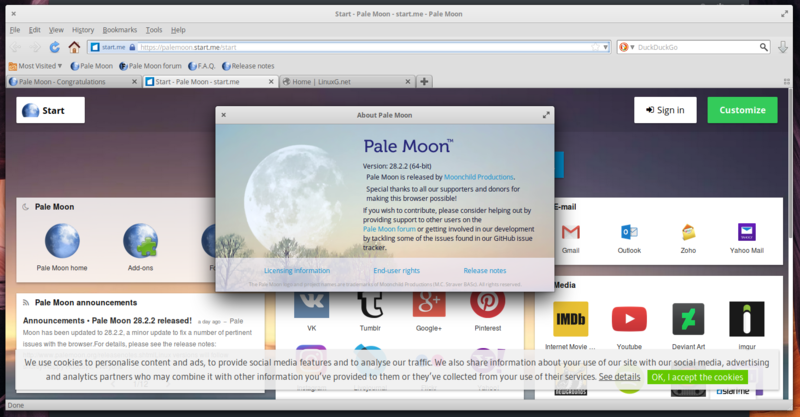 Pale moon is based on Firefox, has support for the official Firefox extensions, but does not contain all of the Firefox features, including: social API, accessibility features, WebRTC and has some specific customizations and configuration options which are not available on Firefox. Also worth mentioning, Pale Moon did not adopt the Australis interface and is not planning to. For Ubuntu, Elementary OS, Linux Mint and other Ubuntu based systems, palemoon is available via repository, so installing it should not cause too much pain. Follow the instructions for your operating system exactly and everything should run smoothly. $ sudo sh -c "echo 'deb http://download.opensuse.org/repositories/home:/stevenpusser/xUbuntu_18.10/ /' > /etc/apt/sources.list.d/home:stevenpusser.list"
$ sudo sh -c "echo 'deb http://download.opensuse.org/repositories/home:/stevenpusser/xUbuntu_18.04/ /' > /etc/apt/sources.list.d/home:stevenpusser.list"